Let’s continue looking into the textual contest at the end of Matthew 6:13: the basic question is, are the words “For yours is the kingdom, and the power, and the glory forever, Amen” – ὅτι σοῦ ἐστιν ἡ βασιλεία καὶ ἡ δύναμις καὶ ἡ δόξα εἰς τοὺς αἰῶνας ἀμήν – part of the original text, or not? Matthew 6:13b in Codex L.
As we saw in Part 1, over 98% of the Greek manuscripts that have this verse include these words (including Codex W) – but it is not included in the important manuscripts Vaticanus, Sinaiticus, Bezae, the fifth-century uncial fragment 0171, and the fragmentary palimpsest Codex Z (Dublinensis, 035). It is not supported by the core representatives of family-1, but it is included in family-13. The Gothic version and the Armenian version (and others) have it, but most representatives of the Old Latin version, as well as the two most ancient copies of the Middle Egyptian version, do not have it. The early patristic writers Tertullian, Origen, Cyprian (in Treatise 4), Ambrose, and Cyril of Alexandria (in Catechetical Lecture XXIII) comment on the Lord’s Prayer but do not mention this reading, and several others (Hilary of Poitiers, Caesarius, Gregory of Nyssa) do not mention it when they use this verse – but it was quoted by John Chrysostom (c. 400), and it was quoted in Apostolic Constitutions (380), and it appears to have been utilized by the author of the Didache – an exceptionally early composition (early 100s). The unknown author of the Latin composition Opus Imperfectum in Matthaeum (early 400s) also quoted Matthew 16:13b, in Homily 14, in a way which shows that he read it in his text of Matthew. This reference is interesting, not only because it gives additional Latin support to the reading, but because it augments the theological range of the support for the reading; while Chrysostom was thoroughly orthodox, the author of Opus Imperfectum was not. With all that in mind, we now turn to some evidence which is not featured in the usual textual apparatuses: amulets. The Lord’s Prayer was ubiquitously used in church-services, but it was also applied to a different purpose in some parts of the Roman Empire: when Christians made small amulets containing snippets of Scripture, one of the most-used passages in such items – after the beginnings of each of the Gospels – was the Lord’s Prayer. Let’s take a look at some of these amulets and the text(s) they contain. ● Papyrus Ct.YBR 4600, housed at Yale University, was made sometime in the 500s-700s. It consists of a single sheet of papyrus, blank on the reverse side. It contains Matthew 6:9b-13, but is torn down the middle; as a result about half of the text is not extant. In verse 13, it appears that the word “Lord” was added after “Lead us not into temptation.” After “But deliver us from evil,” the doxology does not appear, but rather than come to a close, the text continues with one more line, which says, “To our Lord.” It seems debatable whether “To our Lord” should be regarded as a closing-title, or as a phrase introducing some non-extant continuation. ● Papyrus Oxyrhynchus LX 4010 is assigned to the 300s. It is a liturgical prayer, and instead of beginning with “Our Father” it has an introductory portion (which cannot be confident deciphered due to extensive damage, but which seems to address God as the All-powerful Master and God of all comfort). In v. 12, this witness reads ωσπερ instead of ως. It does not have the doxology after “but deliver us from evil.” After “our debtors” and “into temptation,” the remainders of two lines have been obliterated. It appears that after writing, “but deliver us from evil,” the writer repeated the words “deliver us.” It is possible that more text followed on another page. ● Á3 (Talisman 3), also known as BGU 3.954, was excavated at Herakleopolis Magna, Egypt, and is assigned to the 500s. It contains – or contained – an apotropaic prayer (i.e., a prayer for protection and health), and it begins by addressing God as the All-powerful Master. (It is similar in this respect to P. Oxy. LX 4010.) An individual named Silvanus prays for protection from demons, and from illness, and then introduces “the Gospel-prayer” – Matthew 6:9b-13. The word “Lord” was added after “Lead us not into temptation.” After that, the document is damaged but enough has survived to show that it contained a doxology that included the words “the glory forever.” This is followed by snippets from John 1:1 and Matthew 1:1 and a final petition for health. ● Á6, also known as Papyrus Iandani I.16 is an Egyptian document from the 400s or 500s. It includes the text of the Lord’s Prayer, and includes a doxology – “for yours is the glory forever and ever.” It has other material besides the Lord’s Prayer: it also features the opening lines of Matthew 1:1, part of Matthew 8:1 (or Luke 9:37), part of Luke 11:1-2, snippets from Psalm 90, and more – all rather garbled, but as Brice Jones has noted, Ernest Schäfer helpfully diagnosed the cause of the mix-up and rearranged the text that the novice copyist was attempting to write. ● Á13, also known as Papyrus Duke inv. 778, made in the 500s, is a double-sided amulet; Psalm 91 (in Greek) is on one side and the Lord’s Prayer is on the other side. 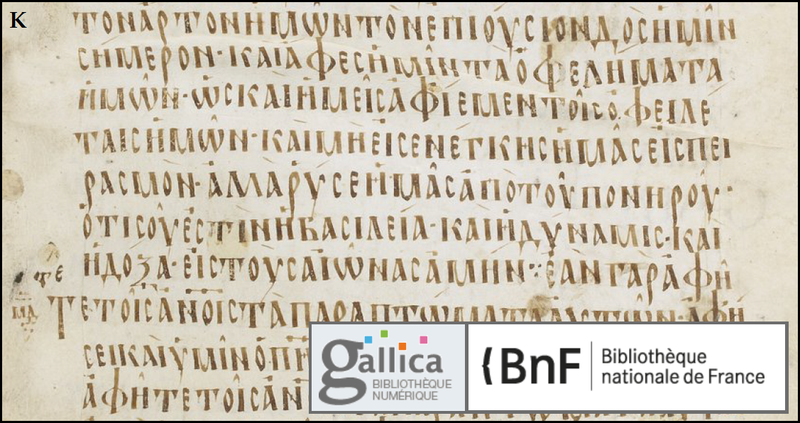 A detailed description of this document can be found in an article in the 2004 Bulletin of the American Society of Papyrologists by Csaba La’da and Amphilochios Papathomas. (For a picture and transcript, see this link.) The words “Your will be done” and “as we forgive our debtors” are absent. The word “Lord” appears after “Lead us not into temptation” (a feature also seen in Á3). After “Deliver us from evil,” there is an expanded doxology: “Through the only-begotten” – at this point there is a hole in the papyrus which might have contained the contracted word “Son” – “for yours is the glory and the power and the all-holy Spirit, now, always, and forever and ever. Amen.” (“Amen” is written as ϘΘ, two Greek letters which have a numerical value of 99, the same as the word ἀμήν (α = 1, μ = 40, η = 8, ν = 50). In the papyrus, the Θ is only minimally extant.) This concluding phrase is similar to the way in which Gregory of Nyssa concluded his catechetical lecture on the Lord’s Prayer, and it also resembles a liturgical formula, which we will consider soon. The Prayer of the Apostle Paul includes the request, “give healing for my body when I ask you through the Evangelist,” and although this has been interpreted as a reference to Paul, I suggest that “the Evangelist” means the same thing as “the Gospel-prayer” in Á3. Isidore of Pelusium (late 300s-450) also quoted the doxology, twice, in the course of commenting on the Lord’s Prayer, in his Fourth Book of Epistles, #14, To Eutonius the Deacon (cf. Migne PG Vol. 78, col. 1073 and 1076). This is especially interesting since he resided in Alexandria before taking up monastic responsibilities at Pelusium; one would expect him to have used instead a text that agreed with the flagship manuscripts of the Alexandrian Text. Other evidence joins Isidore in confirming that the non-inclusion of Matthew 6:13b was not the only reading known in Egyptian transmission-lines. Codex L and minuscules 33 and 1241 are among the MSS that support inclusion. 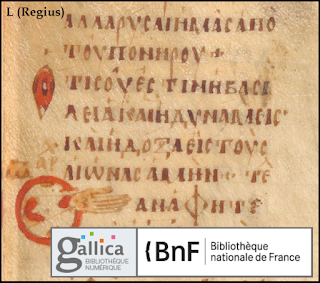 Minuscule 892, widely considered the most Alexandrian of all Gospels-minuscules, also includes the doxology. When one considers that Sahidic and Fayummic versions support “For yours is the power and glory forever, Amen,” a case can be made that the non-inclusion of the doxology is essentially a Western reading than has Alexandrian support: The Alexandrian witnesses À B and 0171 and Cyril have the shorter reading, as does the Middle Egyptian version; however, that seems to be the extent of support for non-inclusion among Alexandrian witnesses. Meanwhile, among the Western witnesses for non-inclusion are D, at least seven Old Latin copies, Tertullian, Cyprian, Ambrose, the Vulgate, and Peter Chrysologus. So: which reading accounts for the creation of its rival? Though this question expresses a standard text-critical canon – the paramount text-critical canon – it is in some cases an oversimplification, because some readings created by copyists (especially shorter readings) may arise due to factors that are not suggested by rival readings. In the case at hand, it should be clear to everyone that the use of doxologies was very widespread, not only in the writing of personal prayers, but also in prayers offered in church-services. The amulets provide examples of the former; the Didache provides examples of the latter. It should also be clear that the Lord’s Prayer was subject to adaptation – sometimes via expansion, and sometimes via abridgement. (The prayer in Matthew 6:9-13 was vulnerable to abridgement via harmonization to the prayer in Luke 11:2-4, just as the prayer in Luke was vulnerable to expansion to the prayer in Matthew 6.) Additional examples of prayers with doxologies being offered in church-services are found in the liturgies that have been handed down from antiquity. Let’s consider two examples. In the late 1800s, Dean Burgon, conscious of this liturgical custom, proposed that it is so ancient that it accounts for the rival reading in Matthew 6:13. Several pages of Causes of Corruption are devoted to the exploration of this variant-unit. Burgon pointed out that if the doxology was added to the text of Matthew after previously existing as a liturgical formula, then instead of seeing, “For Yours is the kingdom and the power and the glory forever, Amen,” we would see, “For Yours is the kingdom and the power and the glory, of the Father and the Son and the Holy Spirit, now and forever and to the ages of ages” – which, although it is what we see in the Anaphora of Basil and the Liturgy of Saint James, is not what we see, except in two manuscripts (157 and 1253). The idea that Matthew 6:13b was based on a liturgical formula, Burgon argued, is just the opposite of what ought to be concluded: instead, a variety of liturgical formulas are based on Matthew 6:13b. Burgon proceeded to propose that the loss of Matthew 6:13b was related to the custom of having the congregation recite the Lord’s Prayer up to the end of “deliver us from evil,” and then having the priest alone recite the doxology. An early copy with a mark beside it – intended to mean that the doxology was not to be read aloud by the congregation – could easily be misconstrued by a professional copyist to mean that the doxology was not to be written by the scribe. 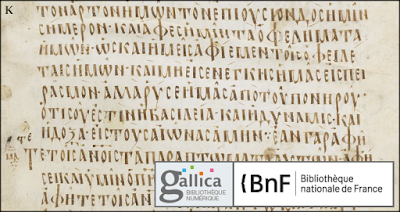 And thus the whole phrase failed to be perpetuated in a transmission-line that branched out into the base-texts of the Old Latin version(s), and the Alexandrian text-form represented by À B Mae, and the text used by Origen. Matthew 6:12-13 in Codex K.
The words “and ever” in the liturgy are a natural expansion – but an expansion of what? When we see, in the Didache, a description of the Lord’s Prayer being used at a communion-service in the 100s, and when we see, from Irenaeus, a reference to the phrase “forever and ever” being used at the communion-service in the 100s, it seems reasonable to conclude that Irenaeus is referring to an expansion of the same Matthean doxology described in the Didache. Thus the table was set, so to speak, in the 100s for a scribal mechanism that could cause the accidental loss of Matthew 6:13b in exemplars that were in the ancestry of both the Old Latin version, and a significant segment of the Alexandrian text-stream, and a form of Matthew used by Origen. This accounts for the absence of the doxology in the quotations by Latin writers reading Old Latin copies (such as Tertullian, Cyprian, Ambrose, and Augustine), and for the absence of the doxology in copies used by Origen. Since the days of Erasmus, it has been alleged that the doxology in Matthew 6:13 is an accretion that slipped into the text from the liturgy. In the 1700s, Bengel expressed this idea in his Gnomon (Vol. 1, pages 192-195), pointing out that the medieval writer Euthymius, in the course of criticizing the Bogomils for not using the doxology, claimed that it “the choral conclusion added by those who were the divine illuminators and guides of the church.” (Without closer study, I cannote tell if Euthymius really criticized the Bogomils for avoiding a reading which he admitted was an accretion, or if Euthymius meant nothing more than that Matthew 6:13b was used as the framework for part of the liturgy by those to whom the liturgies are attributed.) Bengel’s research on the passage can be consulted in the text-critical appendix of his 1734 Η Καινη Διαθηκη and in his Apparatus Criticus. This is a convenient explanation for defenders of the Alexandrian text, but the same thought, in the minds of early scribes, would be an effective impetus for the removal of the doxology from the text of Matthew. Picture a Christian in the second century attending church-services in which the congregation recites the Lord’s Prayer up to the end of “Deliver us from evil,” and the priest (or elder) proceeds to recite the doxology. In the mind of some participants, the words recited by the congregation – and only those words – were perceived as the prayer; the doxology being regarded as a liturgical flourish. If such a participant were to proceed to become a scribe, it would be very easy for him to conclude, when encountering the doxology in Matthew 6:13 in an exemplar, that the scribe of his exemplar had mistakenly included a liturgical flourish in the text – and all the more easily considering that there is no such doxology in Luke 11. Of course no one on earth can demonstrate that this happened in the second century; yet the implication of this theory – that Mt. 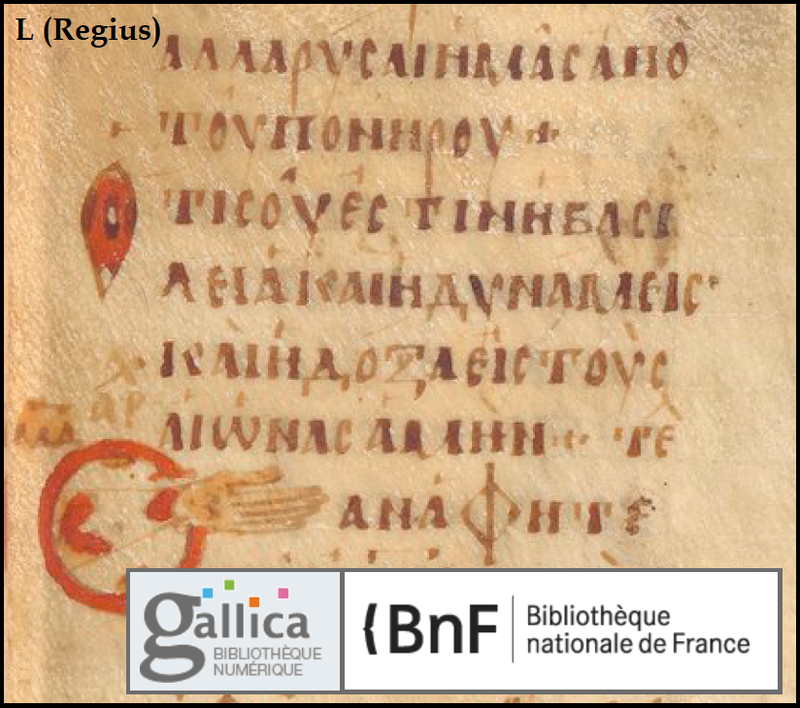 6:13b is original – is supported not only by a vast proportion of manuscripts (over 98%), but by the significantly earliest witness (the Didache), and by widespread witnesses (Chrysostom, Isidore of Pelusium, Codex W, L, Δ, 892, 1192, 2812, the Peshitta, the Gothic version, the Armenian version, the Opus Imperfectum, etc.). The non-inclusion of “For Yours is the kingdom, and the power, and the glory forever, Amen” should be considered an early Western reading that was adopted in Egypt but which failed to gain wide acceptance in other Greek transmission-lines (not unlike the non-inclusion of τὰ παραπτώματα αὐτῶν in Matthew 6:15). Readers are encouraged to explore the embedded links for additional resources. Blessed to read your newsletter. I had added something to your parenthetical note. Koppa (qoppa) can be written a few different ways in the uppercase, so I had to look this up to see what the first Greek letter was. I thought this information might be helpful for others. NOTE: "Amen" is written as ϘΘ, two Greek letters (Koppa or qoppa Ϙ, ϙ & Theta Θ or ϴ, θ) which have a numerical value of 99, the same as the word ἀμήν (α = 1, μ = 40, η = 8, ν = 50.